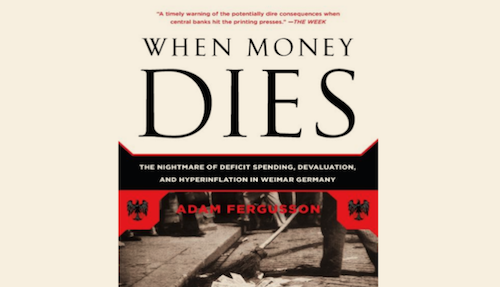 Last week I finished reading the book “When Money Dies” originally published in 1975 by Adam Fergusson (reissued 2010). I sought out this book primarily due to my concerns about Quantitative Easing, but as I read this book I found myself frequently wondering and worrying about Greece. Fergusson’s book is a fascinating economic (and political) history of Germany from the end of WW1 in 1918 through 1924. The book frequently goes into granular detail, and at times has a near daily accounting of the tribulations of the German state and its people. I was especially fascinated by the wildly varied responses and impacts of various economic segments of German society. At various times, despite near continuous devaluation of the Mark, much of German industry remained operational and in fact continued to expand. Not unlike today’s Quantitative Easing, continuous printing of ever greater values of Marks stimulated the economy, allowing Germany to maintain both high levels of employment and economic / industrial expansionary investment. Also much like today’s experience with QE, the challenge for Germany was how to stop printing money without causing a total collapse of the Germany economy (which eventually was Weimar Germany’s fate). The devaluation of the Mark was absolutely staggering, and at times the author struggles to document the unrelenting pace of devaluation. Periodically the book becomes rather repetitive, which accurately mirrors the historical events being described. The author struggles with tragic adjectives; after a few chapters it simply becomes impossible to find creative new ways to describe the ever greater depths of unfolding economic tragedy. The reader gets a taste for the experience of the Germans during this period; each time it seems that things can get no worse, and that a bottom must certainly be reached, Germany prints a new larger denomination of Mark and the deflationary spiral plumbs new depths. The events summarized by Fergusson happened less than 90 years ago, and were experienced and suffered by a well developed Western economy. However, a century is a long time. Could these events be repeated in this modern era? Certainly (hopefully)our learned Government and Global leaders are far more enlightened and sophisticated than 1920’s Germany. Or are they arrogantly (misguidedly) confident in their collective ability to ride the fiat currency tiger without getting eaten? It is interesting to note that hyperinflation in the 21st century is not simply an obsolete historical tale. Zimbabwe was in the news as recently as mid-June 2015, when its central bank announced that the old Zimbabwe dollars can still be exchanged for US dollars, at a rate of 100 trillion Zimbabwean dollars per $40 USD. 100 trillion Zimbabwean dollar notes are actually more valuable on Ebay, where collectors have recently paid up to $159 USD. If (or perhaps more likely expressed as when) Greece exits the Euro and resumes printing Drachmas, I am very concerned about the valuation of this newest fiat currency. Will Greece be able to successfully deflate away its serious debt and liability issues, or will the Drachma, along with Greece’s long suffering citizens, experience the German Mark’s hyper inflationary fate?